Cops for Kids, Inc. Holiday 'Tips for Kids' at Chili's, L.E. 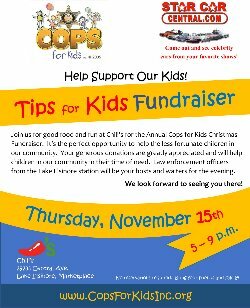 Thursday, November 15, from 5 p.m. until 9 p.m., it’s Cops for Kids, Inc. annual “Tips for Kids” fundraiser at Chili’s restaurant in Lake Elsinore. All tips and donations from restaurant patrons will help underprivileged children have a special Holiday season. Lake Elsinore Police officers will be your hosts and waiters, so dine at Chili’s next Thursday night while helping a good cause at the same time.